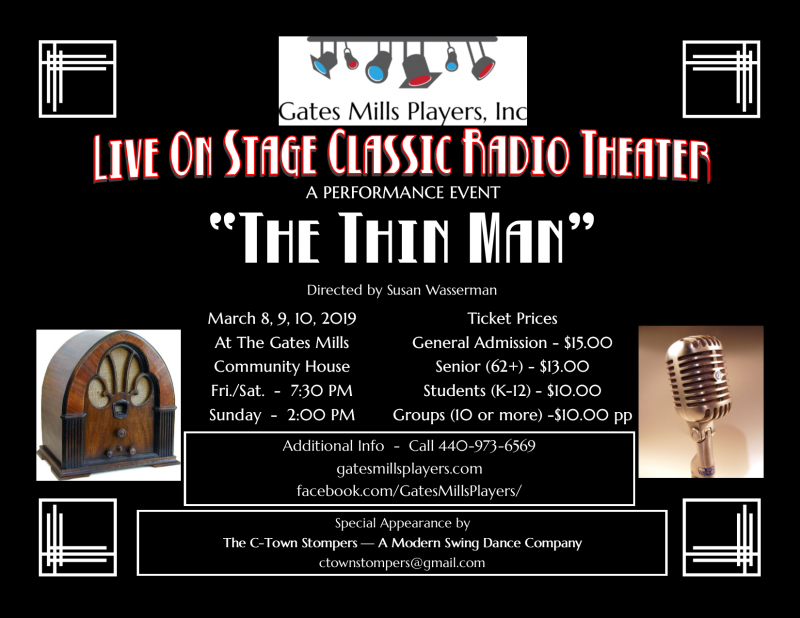 Synopsis: The Gates Mills Players will be reviving the classic live radio play, The Thin Man, a comedic whodunit from the 1930s featuring American iconic duo Nick & Nora. The story revolves around a husband and wife team as they crack the case with plenty of wit, banter, cocktails and an interesting array of characters along the way! Gates Mills Players, Inc. is officially a 501(c)3 non-profit organization. Donations are tax deductible. Since 1948, The Gates Mills Players have been entertaining audiences with productions ranging from dramas and comedies, to large Broadway productions. We hope you enjoy this web site, and we look forward to seeing you either in the audience or on the stage with us!